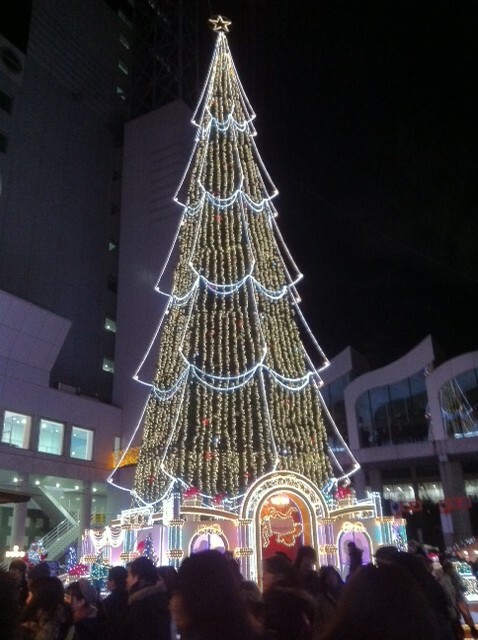 While there’s no religious context to Christmas in Japan, it is still observed as a commercialised holiday. It’s treated as a couple’s festival and is celebrated similar to Valentine’s Day in western countries. Incidentally, the Japanese interpretation of Valentine’s Day isn’t romantic at all – it’s a day for women to give chocolates to their bosses and male co-workers. The romantic context of Japanese Christmas is so strong that during my first winter in Japan, I was advised not to ask female colleagues about their festive plans. 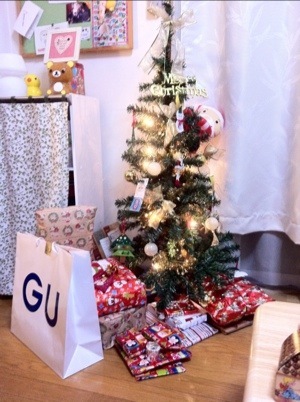 Christmas is a particularly sensitive topic for young Japanese women, especially if they’re single. Not having a date on Christmas is the ultimate confidence knocker. I guess it’s the same as feeling pressure to have a date on Valentine’s Day. 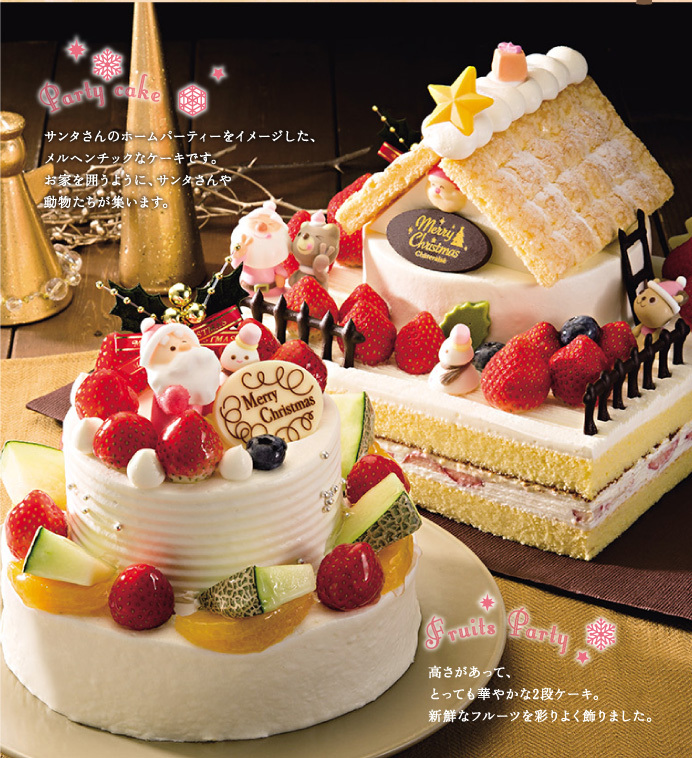 On Christmas Eve, couples go out for a nice meal, exchange gifts, and eat Japan’s festive dessert; cake. Christmas cakes are huge in Japan and any food store worth its salt offers a catalogue of at least 52287482472 to choose from. Some of them are complete works of art and big enough to feed a small army. Traditionally, all of the cakes are bought by Christmas Eve and the left-overs get a dramatic price cut on the 25th. Great! A Christmas bargain, you say? Well, no, not really. Nobody wants to be the person buying a cake on the 25th. In fact, it’s often said that women who are unmarried by the age of 25 are “left-over Christmas cake” and like the discounted cake, will have to set their expectations a little lower if they hope to find a husband. No pressure then! Of course, Christmas isn’t just a day for couples. 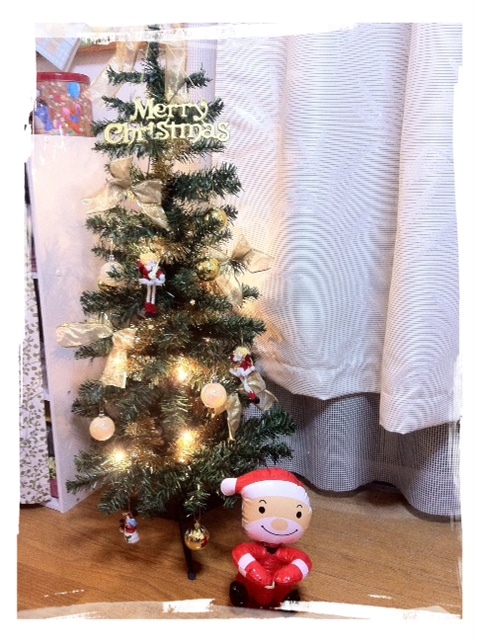 Don’t forget that on Christmas Eve, Santa-San travels the world over, giving presents to children who’ve been nice. So for families with young children, the Christmas spirit is very much alive. They don’t do turkey in Japan so the traditional Christmas dinner is chicken, none other than KFC chicken. KFC really reel in the Christmas punters and it’s so popular that it’s necessary to pre-order your KFC Christmas meal weeks, even months in advance. 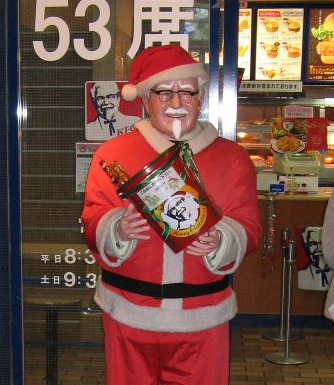 Most stores even dress up their Colonel Sanders as Santa-San. Too add to the holiday cheer, pretty much every store has a Christmas tree or Christmas ornaments of some kind. Some cities even go all out and light up the streets with Christmas lights known as “illuminations”. 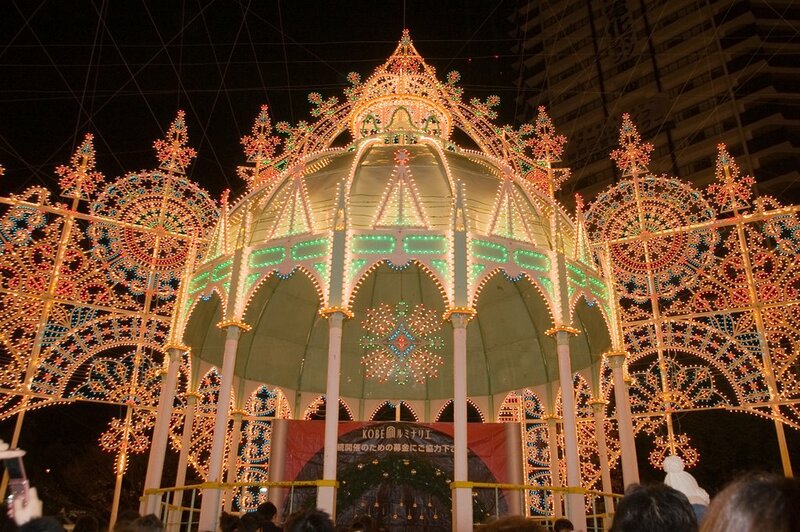 Kobe prefecture has some of the most famous “illuminations” in all of Japan and people travel from all over to see them. 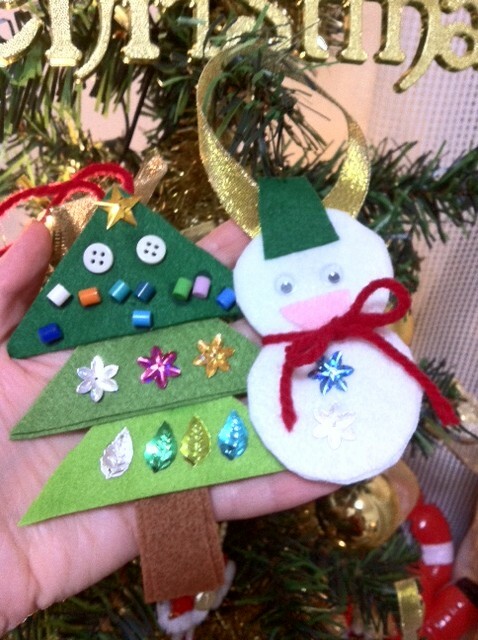 We volunteered at a primary school Christmas party and received these cute-as-a-button handmade decorations in return. 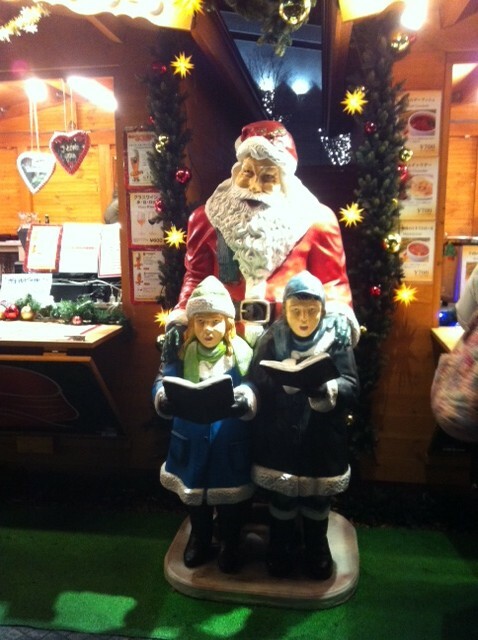 A slightly creepy Santa at the Osaka Christmas market. 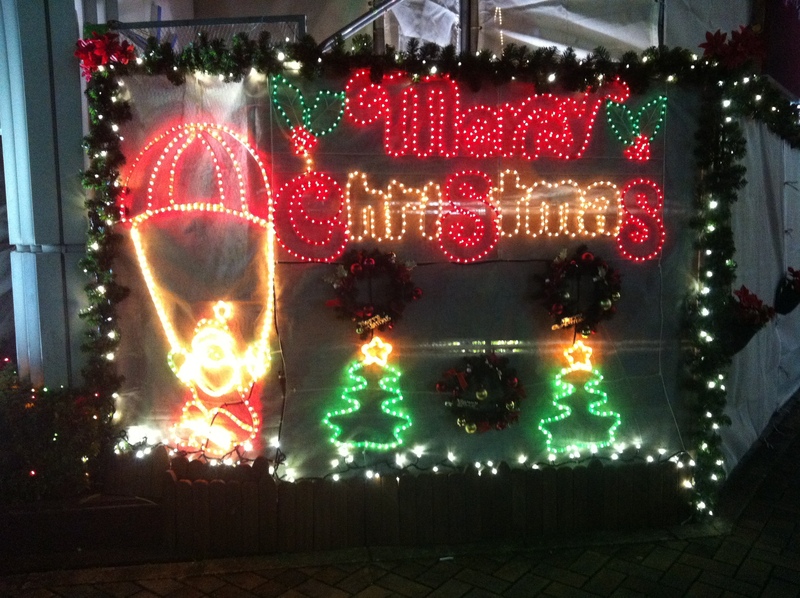 It’s interesting to see the Japanese interpretation of Christmas. 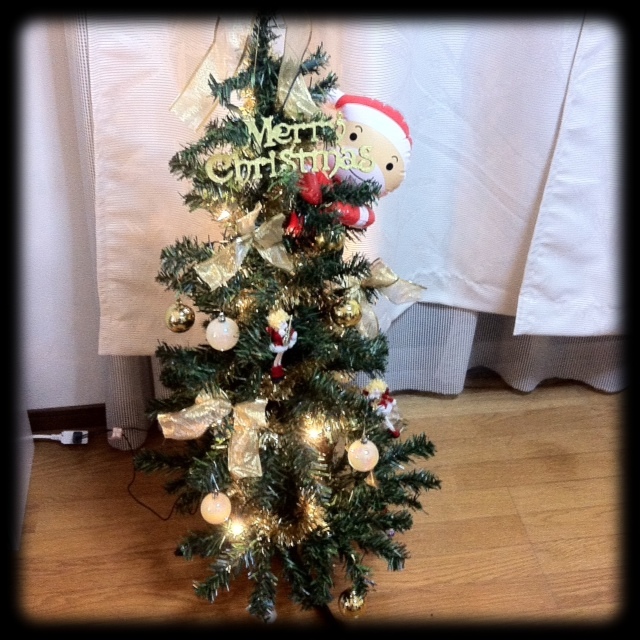 Many Japanese people aren’t aware of how big an event Christmas is for westerners and requests for paid leave on the 25th are often met with confusion. It would be like asking your boss for Halloween or Valentine’s Day off in the western world. It’s always a surprise when I tell my Japanese friends that Christmas Cake is very much a Japanese invention. They’re even more surprised to hear that nobody I know eats chicken, let alone KFC for Christmas dinner. Christmas in Japan is just a regular working day with an undertone of festive cheer but it’s certainly interesting to experience Japan’s unique take on it. 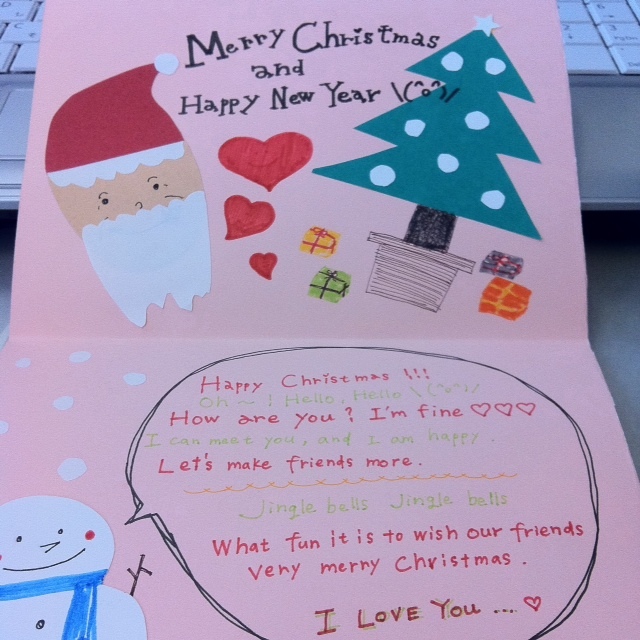 This is definitely the cutest Christmas card I’ve ever received! That’s so interesting to hear how other cultures celebrate the holidays. It’s almost sounds like Christmas and New Years are combined with the need for a date to celebrate, or like you said Valentines. I do love the idea of a Christmas cake but agree, I’ll pass on the KFC! It’s so interesting to experience Japan’s take on the holidays. The KFC isn’t for me either, lol! The Christmas cakes are absolutely amazing though, I could definitely get used to them! 🙂 I hope you had a lovely holiday season!